The farmyard scene depicted in this panel is skillfully executed in a form of inlay patchwork known as 'mosaic patchwork' or intarsia work. The shapes of the farm buildings, animals and birds have been cut from coloured felt and sewn together at the edges with very fine, almost invisible stitches. Detail and texture, such as the climbing plant on the wall of the farm house, the thatched roof of the barn, the mane and dappled coat of the horses are worked in silk thread in simple stitches. The border, which may not be original to the picture, is decorated with appliquéd foliate scrollwork, outlined in chain stitch. Images of country life were very popular in mid-nineteenth century Britain, reflecting a pervasive nostalgia for the past and widespread concerns about the threat posed to rural society and the countryside by the scale, speed and spread of industrialisation. It is possible that the panel may once have formed part of a counterpane made by John Brayshaw of Lancaster exhibited at the Great Exhibition in 1851. Rectangular polychrome wool intarsia panel depicting a farmyard scene with two labourers and a variety of farmyard animals and birds. Edged with a broad border of red wool decorated with a narrow strip of blue wool forming an inner frame and appliquéed with blue wool foliate scrollwork. Detail and texture have been added to panel in silk thread in simple stitches. The panel is outlined in chain stitch in silk thread. Chain stitch has been used on the border to outline the inner frame and scrollwork motifs. 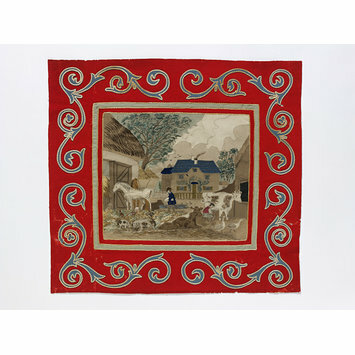 The textile historian Clare Rose has suggested that the panel once formed part of a counterpane made by John Brayshaw of Lancaster exhibited at the Great Exhibition of 1851. The counterpane was included in the exhibition catalogue in class XIX, and listed as no. 382. It was described as ‘a Counterpane of Mosaic needlework in forty-four compartments, each representing a popular print, twelve feet long by ten feet wide, worked in coloured pieces of cloth without colouring matter, with scroll border of new design’. A corner of the counterpane is reproduced in The Illustrated Exhibitor (London, 1851, p. 391). Four scenes of domestic life worked in rectangles with canted corners are framed by interlocking lines which form links enclosing stylised floral motifs. The counterpane is finished with a broad border of scrolling foliage enclosed within narrow strips of cloth, with a bold foliate rosette in each corner. 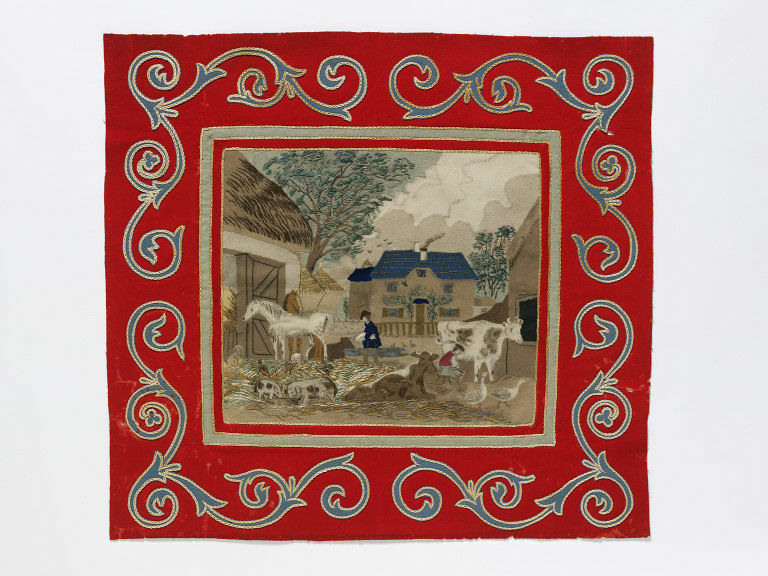 The scenes depicted in The Illustrated Exhibitor do not include this farmyard scene but differences in the techniques used to create the panel and its border support Rose’s suggestion that the picture may have been taken from a larger textile. The source of the farmyard scene has not been identified. Morris, Barbara. Victorian Embroidery. London:Herbert Jenkins, 1962. p.64.